As far as my crabs and I are concerned, shrimp has to be the best food on this very Earth. Every time I place a piece of shrimp inside of the crabitat, it is never ignored! The shrimp is constantly thrown all around the tank - a sign that they really enjoyed the meal. 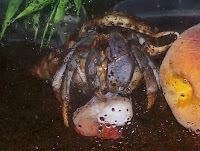 Not onnly do crabs adore shrimp, but it is also a complete protein source for your land hermit crabs. Krill and freeze-dried shrimp will also offer the same nutrients as a whole shrimp would, so that is okay to feed, too, although mine usually prefer fresh (although freeze-dried krill is usually dragged around the tank). Protein is extremely important in a land hermit crab's diet so make sure you offer shrimp!